Asma Khan is @DarjeelingExpress on twitter. I understand her supper clubs are out of this world – check out her website here. Even as you open the door to the stylish West End apartment that’s home to @DarjeelingExpress and her supper club, the aromas tell you you’re heading into something special. I have been excited about this for weeks. @DarjeelingExpress is cooking a Wedding Feast, and this may be the closest I ever get to being a member of an Indian wedding. It’s also only the second or third time I’ve been a dinner guest in an Indian home. And then, of course, there’s the chef herself: I follow everything @DarjeelingExpress does on Twitter, I’ve eaten her sensational food before, and have deep respect for her approach to cooking. I am hungry for everything the evening has to offer. And that’s just as well, because I am literally eating for six people tonight. I’m eating for wife Sue who wants to meet Asma and her wonderful cooking, but is caring for a friend tonight. I’m eating for close-buddy Miguel, who had the supper club triple-starred in his diary, but has been called last minute to his Dad’s bedside. I’m eating for close-buddy Marc and partner Alison who are sweating on Asma’s waitlist. And finally I’m the eyes, ears – and palate – of @Biryaniquest aka Poornima Kirloskar-Saini, a gourmet blogger dedicated to finding the ultimate Biryani. To top off the evening, @Biryaniquest has offered me a dream commission: capturing the supper club in a guest piece for her delicious and wise food blog. And there at the open door to the apartment is @DarjeelingExpress herself, aka Asma Khan, welcoming guests to the supper club Wedding Feast. And I know from the way she greets us each by name, remembers a dish or ingredient recently shared, that the evening will be delicious from start to finish. Great food is high art, and there’s a theory doing the rounds that all art is ultimately autobiography. I know I’m writing a curry blog here – but please stay with me as I appear to drift off for one sentence into the theory of art. I’ll bring it straight back to the Wedding Feast. The point is this, whatever the artefact – from political memoirs to Harry Potter – the artist can only draw on their life experience for inspiration. It may read like cold fact, it may read like wild inspiration – but ultimately every twist in Tony Blair’s autobiography and JK Rowling’s best-seller comes from the same place: the events that shaped the author. Back to Asma’s Wedding Feast. The reality is, I think, that what the guests are about to discover at the supper club is @Darjeeling Express’ and her life story. Whoever you are, your life and your cooking are one and the same thing. So, as we’re all enjoying the gourmet counterpoint of the Dahi Puchka Chaat – shells as delicate as petals dunked in spicy tamarind sauce – Asma joins our table, telling how she enjoyed these street-snacks in the India of her youth. It all makes sense: we are there with a childhood Asma at the vendor’s cart. Other starters arrive to tempt us: Pani Puri, Lentil Fritters and Darjeeling Aloo Chop. Three chutneys on the table: each so delicious I would have gone home happy if nothing else had been served. But this is Asma, and the symphony of a meal keeps on building. As we enjoy the Chicken Chaap, Asma joins us to put the dish in time and place, spiriting us back to 1875 when Mughlai cooks brought the dish to Bengal after the Mutiny. Time travel doesn’t get tastier than this. Parathas, Baghare Baigan, Tamatar ka Cutt are served. All delicious, and with them a Hyderabadi Mirchi Ka Salaan that’s so moreish I need to keep it with me like a friend. Asma promises to send me home with a portion. She explains that the dish would normally be served with a biryani from the same city – but in her family it’s served with a biryani from her home city, Calcutta. We all feel part of the gang. And suddenly, it’s there: the Wedding Feast biryani itself – two bowls on our table overflowing with plump grains of rice and aromatic mutton. For a moment, we sit immobile – and then, as we eat, conversation stills. I don’t think I’ll ever forget the taste of that dish. Whoever does or doesn’t get married in the company of a biryani, the dum-cooked mutton and rice are set for a lifetime of wedded bliss. They are made for each other. The mutton tumbles from the bone as soft as grain. And literally each grain sits on your palate as a complete world of taste. If @Biryaniquest could have joined us, her journey would have ended with that dish. An Indian reincarnation of bread-and-butter pudding called Shahi Tukra that I still miss. And my first taste of paan: unlike anything I’ve ever eaten. To close the evening, Asma serves us Makaibari First Flush Darjeeling tea – picked at dawn. The grower himself has joined us, and talks the supper club through a tea with the heritage of a grand cru wine. How, how do you sum a meal with fourteen courses, each brought to you in time and place by Asma? I put the question to the table. Those two summaries nail it for me. if Asma’s cooking, be there. 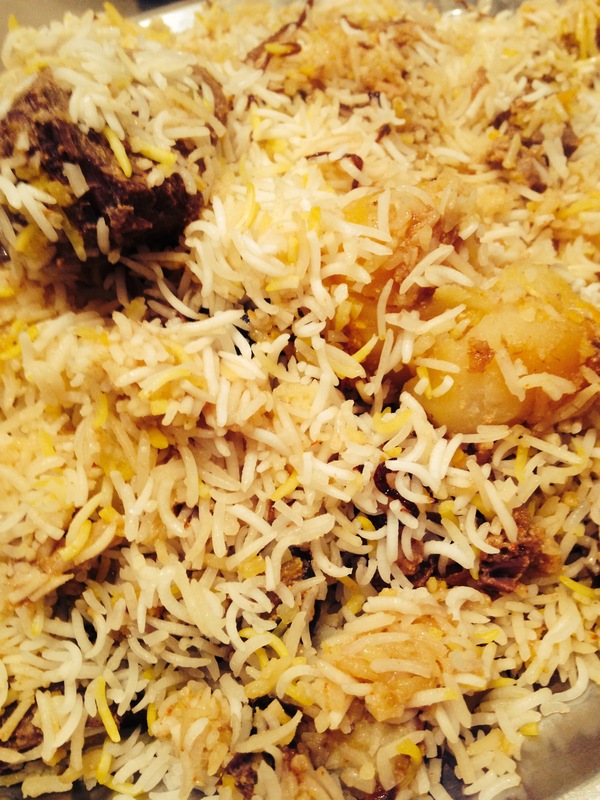 This entry was posted in Biryani and tagged adam baines, asma khan, biryani, darjeeling express, Indian food, indian food in london, indian supperclubs, mutton biryani by Poornima. Bookmark the permalink. @GoodKorma @Biryaniquest Thank you dear Adam! Really appreciate the time and effort you put into it! @GoodKorma @Biryaniquest You are too sweet! Thank you Adam! A review of my Wedding Feast Supperclub written by the wonderful @GoodKorma for @Biryaniquest http://t.co/viRwbO8gUq Love the eloquence! If Asma fries an egg she will make it taste different. I have yet to eat anything that didn’t taste good at Asmas’ and I’ve had the pleasure of eating her food a decade before Darjeeling Express came along . She puts in so much love in her cooking you can taste it .